Meet John and Jenny Bertsch of Northglenn, CO, super volunteers and parents of Jesse – a second year trumpet player for Blue Knights Drum and Bugle Corps. John and Jenny became involved with the Blue Knights as soon as Jesse “got bit by the drum corps bug”. Pretty rad set of wheels! They must have a musical background, right? Not really. While John did play trombone in high school pep band, neither John or Jenny have any background beyond that or in the marching arts. We will label them “aficionados”. How do they help? John is an extremely talented prop builder and invaluable repair guy. Last year he built new speaker carts for the pit and this year he came through with our mirror prop stands and a cart for storing/transporting the mirrors. You’ll find Jenny getting in there to help with the props and repairs, too. John has seen many late nights and short sleep to complete projects for us. We owe him a pillow or something. The speaker’s in the house that John built. 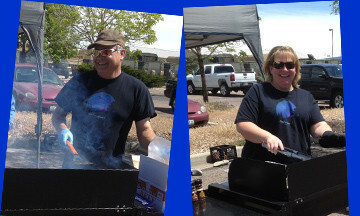 Jenny and John have been “go to” people for grilling equipment and services for the Memorial Day picnic the last two years and for the Percussion Clinic at Drum Along the Rockies this year. Jenny helps us with many food donations and led the way to get the 300 some ears of shucked corn we’ve enjoyed at the Memorial Day potluck the last two years. 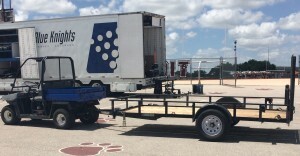 There are also many equipment donations – including a commercial size grill that is now on tour – thanks to them. When nearly $1,000 of power cables were stolen from our food trailer this winter, John was able to find a source for the heavyweight cabling and complete the fabrication. He has some great connections and experience that help make some of these things possible, but they both have great big hearts and talents that makes so many things possible. Do they have time for anything else? It seems they do. John and Jenny also work with the Mountain Range High School Marching Mustangs and with Northglenn Performance Theatre spending “free time” building props, serving meals, fitting uniforms and costumes, pushing pit, and planning celebration banquets. In addition, they find time to be involved in Boy Scout Troop 98 where John is a Scoutmaster. John and Jenny demonstrate that if you have the passion, you will find a way. 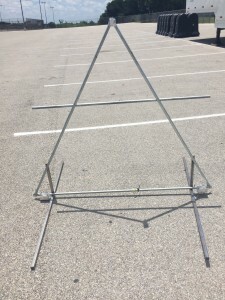 Need 36 Mirror Prop Stands? No Problem! To summarize, the reasons they volunteer are “…to support a good cause. For the satisfaction,. To make a difference. To do the right thing. For the joy on the faces of those who benefit. For being a little part of the big picture. Or maybe – just … “Because…“. 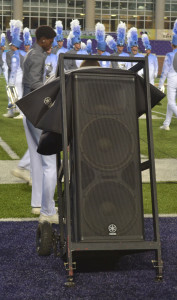 On Behalf of Ascend Performing Arts and the Blue Knights – Thank you John and Jenny! ∴ Would you like to find your volunteer home with us? Visit our Volunteer web page at https://ascendperformingarts.org/support/volunteer/ and send us an email to connect. Your home can be here. Make our youth your extended family!